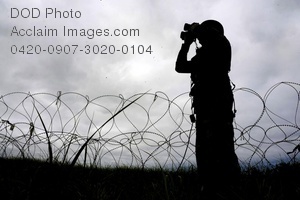 Description: Free, public domain image: Soldier Standing in Front of Barbed Wire Using Binoculars. U.S. Army Sgt. Eddie Wilkins, Avenger Battery Non-Commissioned Officer in Charge, 263rd Anti-Air Missile Defense Command, South Carolina National Guard, visually searches for a opposing forces aircraft during Exercise Amalgam Dart, Camp Rilea, Oregon, June 15, 2009. (U.S. Air Force photo by Technical Sgt. Sean M. Worrell.